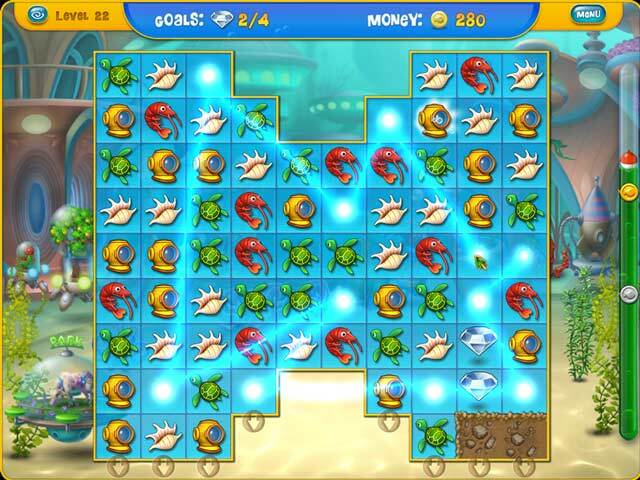 Dive into the all-new game in the legendary Fishdom series! Submerge into the unique deep-sea world with your amusing aquatic buddies that will never let you feel bored! Take care of them; watch them play with each other, as you travel in time through different epochs. Decorate your fish tanks with over 150 exclusive ornaments and 8 immersive backgrounds. Enjoy 250 new Match 3 levels with perfected mechanics. Your pets are waiting for you, go check them out in Fishdom: Depths of Time! 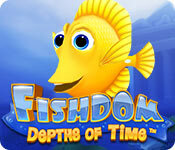 Fishdom: Depths of Time is rated 3.3 out of 5 by 29. Rated 5 out of 5 by lacard from Great Relaxed Mode Because of the negative reviews, I had avoided this Fishdom. But I had already played the last Fishdom into the thousands and no more new tanks. This Fishdom is insanely difficult but you can turn off the timer, spreading oil, and/or time bombs. Or you can turn each item on separately. Makes for an interesting game over the long term. Changes in the 4-match bombs made it fun. The graphics are beautiful. The fish and decorations are funnier and interact more than the other Fishdoms. The prehistoric mammoth and girl can toast marshmallows together. The only major glitch so far is the buying-all-fish achievement. I'm on tank 10 and I've bought all fish at least twice but the achievement doesn't register. Some of the achievements relate to the spreading oil and time bombs so I may not make those. Or I may try them in the future. If getting gold and all achievements is a priority, you may not like this Fishdom. But if you're looking for a relaxing way to spend time and don't care about achievements, you might like it. Try before you buy. Rated 5 out of 5 by FMAMACAT from Fishdom Depths of Time I have all of the Fishdom games. I enjoy playing all of them.The only thing you do in this one is meet your goals, Sometimes you dont get the game right away, Then you replay it, Turn off your timer, If you like M3 games you will like this one. Rated 5 out of 5 by gamezoo from Perfect Match 3 game. I love this game. I love how challenging it is and that it has a 'Relaxed' mode. I did have a difficult time finishing one level but I started the game as a different player and paid better attention to the 'Tips' the game gives you. When I got to that level again I was able to finish it in no time. I also like that the squares are bigger in this game. It makes it a lot easier for us senior citizens to see the boards better. And I really love being able to decorate my tanks with such colorful, pretty objects. This is my favorite Fishdom game. Rated 5 out of 5 by SimplyLucy from Totally Tanked With Fun! The interactive fish are back with their aquatic fun! I love the fact you can name the fish, decorate your tank and select different backgrounds to make your tank unique. As you go higher up the levels, the harder the game becomes (and yes, frustrating at times), making you really think and plan your next moves. The graphics and sounds are superb. Well worth a try. And for my money, this game is truly a welcomed addition to the Fishdom series! Rated 5 out of 5 by Justy1002 from Pleasantly Surprised I've dabbled with Match 3 games in the past, although they are not my go-to game. However, this game caught my eye, and what a fun time I have playing it! As the levels increase, so does the challenge. You have the option to turn on/off the timer, as well as two other obstacles that increase the level of difficulty. I played with the timer and other obstacles on, and you can replay a level immediately if you do not finish with a gold level. However, I don't see anywhere that you can go back to a specific level later on, if you chose to exit the level without completing it in gold time. It doesn't seem to matter in the long run anyway. Each level has an objective, and once reached, the level ends. Finishing a level earns you money, which you can spend to purchase fish, and items that increase the beauty of your tank. You also earn stars that will increase your level, which over time, the higher your level, more fish/items are unlocked for purchase. The faster you finish a level, the more money and stars you earn. You also gain stars for cleaning your tank when it gets dirty, and feeding your fish when they are hungry. They never seem to die either, so that's a plus. Additionally, achievements will earn you money and stars once completed. I love that you can choose the name of your fish if you don't want the one that automatically generates for you. I especially love how the fish interact with you! Particularly, when you are exiting the game, and return to the main menu, your fish will ask you not to leave, or tell you they will miss you, or joke about how the "big letters" (the game title on the screen) are blocking their view of things. You can also interact with individual fish by clicking on them. They have lots to say, and although some of it you've heard before, they really do have a rather large vocabulary of things to say so it doesn't feel like they are on a looping dialogue. There's also a "Fishipedia" that provides you with factual information about each type of fish available for purchase. Overall, I find myself enthralled with this game, with it's adorable talking fish. It brings out the kid in me. 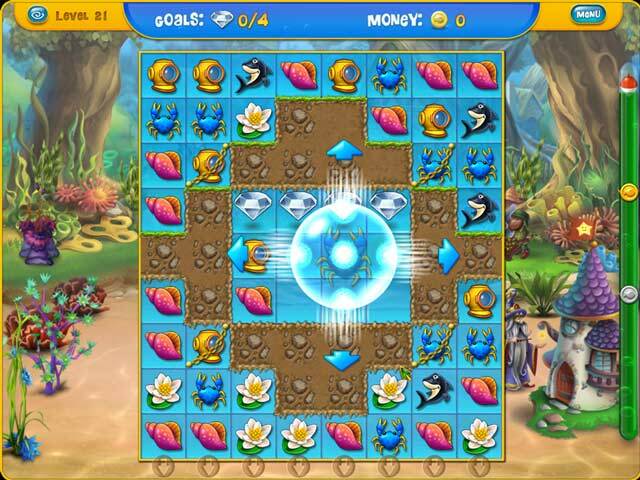 Rated 5 out of 5 by Alee7383 from Better Fishdom I have purchased Fishdom 3 awhile ago and I still enjoy playing it. But this Fishdom is a better one. It is more challenging and has other more interesting things to purchase as well. The same with the type of fish. I like the interaction and the things they say as well. This is an enjoyable and relaxing game to play. Rated 5 out of 5 by Rooobeee from I have never played a Match-3 quite like this one! ***THIS REVIEW IS BASED ON A PREVIOUS BETA TEST*** First of all, let me say that I usually review a game AFTER completing it. However, this is the first time I am reviewing it after a beta test demo. That said, Fishdom is the first Match 3 game I had played that was different from all the rest. 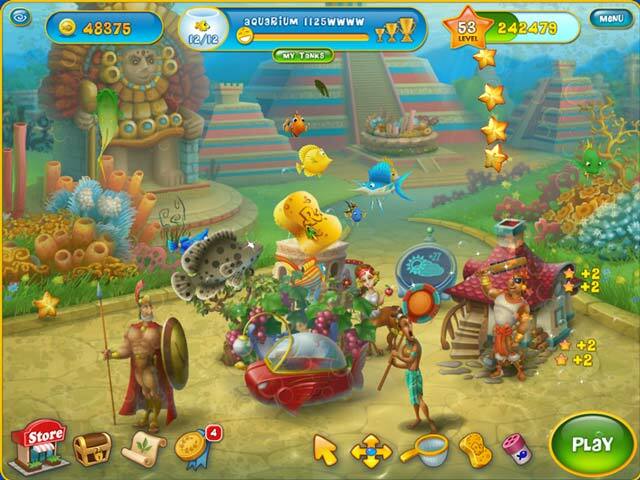 I really liked that I could "earn" money by completing a level and decorate an aquarium. But what really got to me was how interactive the fish were. I thought it was adorable! I played the whole 2-hour demo and got up to level 20 or so. So I do know that the levels do get more difficult as you progress. I also liked how the decorations were themed. On my computer, the graphics were sharp, clear, and very colorful. I'm usually not into cartoonish graphics, but that is how Playrix does their games, and it's done in a cute way. I would recommend this game for anyone who enjoys Match 3 games. And, now that I know what the game entails, I have already bought it and am ready to create my own history-themed aquarium. Rated 5 out of 5 by JaneMoon from JaneyMoon The charme of this game is the opportunity to play the game without time, bombs or liquid. You can choose for yourself. (Sorry for my Enlish, I am from the Netherlands).